If you're looking for promotional products to help your company stand out from the crowd, then check out these 5 perfect custom products for your business. They offer a great branding opportunity, no matter whether you want to give them out to clients, to employees, or at trade shows to prospects. Personalized office supply items can help keep your business' name on someones mind and help ensure repeat orders and quick-access to your information, whenever they need it. Custom binder and index tab sets are one of the best ways to represent your business in a strong and professional way. There are literally hundreds of different ways that we can personalize your ring binders and tab dividers, so whatever you are imagining, talk to us and we can make it a reality. One of the most fundamental ways to customize a binder/tab set is the various different materials that they are made with. We have one customer who orders a purple snake-skin textured binder, as well as a beauty company that gets a smooth laminated ring binder with lovely coated tabs with special half-oval tab extension shapes. We also have those who prefer a traditional vinyl wrap with added padding to make the binder soft, or even easel tabletop display binders for flip-charts. Poly binders are also incredibly popular because they are economically priced and affordable by users of all kinds. We can also add custom pockets, printing of all kinds from single-color silkscreen to full color 4CP to metallic foil stamping and blind debossing. Whatever it is you need, let us help you by getting you a customized ring binder quote today. Call (866)537-2244 (866)537-2244 or email info@buy101.com for help. Custom pocket folders create a beautifully unique presentation and storage solution. We have an extensive production facility that allows us to create a completely customized and one of a kind product for you, including even custom shaped pockets. We can punch windows, create special closures, and so much more. 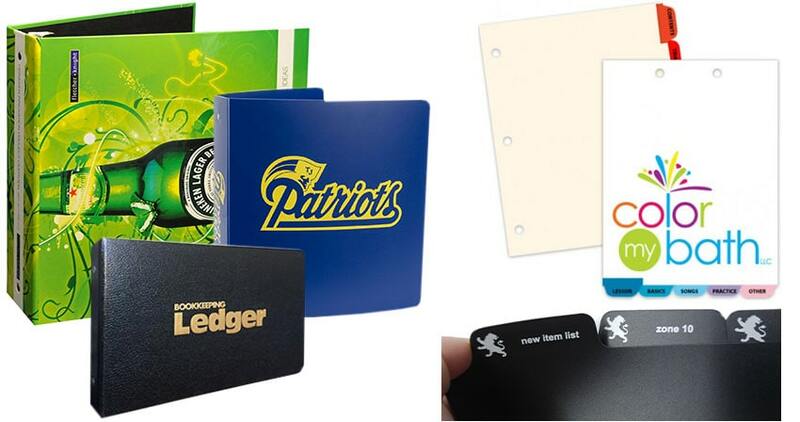 In addition to those more specialized customization options, we can accomplish all of the popular standard customizations as well, such as full color printing, business card holders on the inside pockets, and a variety of standard and custom folder sizes. With our premium customized presentation folder covers you can truly stand out from the crowd with a unique and personalized look. We have a huge variety of material options to choose from including textured paper, smooth paper, coated stock, eco-friendly chipboard and poly plastic. Minimums start at 250 folders, so call (866)537-2244 (866)537-2244 or email info@buy101.com for a quote today. Custom certificate holders are the perfect way to not only store, but display a memorable moment. Whether using them for your school diplomas, your marriage certificate, a class certification, or anything else; a custom diploma holder is a great choice. They come in several different styles and materials, and we can customize them any way that you may need. Whether you want a metallic foil stamp of your emblem, or a printed logo, or even a sleek blind deboss, we can do it all. We make custom diploma covers in several different styles to meet your organization's demands for look as well as budget. Let us help you bring joy while properly representing your organization with the best certificate covers available. Minimum orders start at only 100 covers, so call (866)537-2244 (866)537-2244 or email info@buy101.com for a quote today. We can create custom printed notebooks of all sizes, shapes, designs and materials so you can get exactly what you imagine for yourself or for your client. We offer practical, fresh, and quality customized wire-bound notebooks, perfect bound notebooks, wrap journals, and more. Choose from several sizes from 3 ½" mini pocket notebooks, up to over-sized 7" x 11" notebooks. Some of the most popular sizes include half sheet 5 ½" x 8 ½" and 5" x 7" journals. You can custom order journals in several styles including basic wire bound notebooks or very specialized notebooks with custom closures, pockets, and even custom printed pens. Custom journal notebooks can be made with hard covers, soft covers, and poly covers, all available in a huge variety of colors, textures, and styles. Get more information or get your quote today by calling (866)537-2244 (866)537-2244 or emailing info@buy101.com. Brand your business at the next marketing event with high-quality, beautiful, and affordable custom printed lanyards. We pay close attention to the details, so your final custom lanyards are pristine, for a quality reflection on your business. We only use high-quality printing processes that will not peel or smudge. Made-to-order, we can create almost any custom lanyard to fit your exact needs. You can buy custom printed lanyards online in several materials and printing styles, and can add attachments, accessories and more to make a completely unique and functional product. Whether you want a microweave, ultraweave, or woven-in lanyard, we can help you get the look you need for your identification supplies. We can also make custom badge reels and much more! Call us at (866)537-2244 (866)537-2244 or email info@buy101.com for more information or a quote today.